Significantly fewer patients had radical nephrectomy in 2004 compared with 2015. Abdominal imaging techniques, such as ultrasound, computed tomography (CT), and magnetic resonance imaging (MRI) continue to improve—and as they improve, an uptake in imaging services will likely follow. As a result, there may be an increase in the “incidentalomas” that are discovered. Incidentalomas are unexpected lesions or findings that are not related to the initial indication for the study. For example, CT colonography (CTC) is a colorectal (CRC) screening modality that has been supported by multiple societies, including the United States Preventive Services Task Force, as an alternative to the traditional colonoscopy.1 The focus of the CT is typically on the detection of precancerous (such as polyps) compared with cancerous lesions, however, often, there are other lesions (benign or malignant) that can be detected. For example, a systematic review conducted by Xiong and colleagues comprising 17 studies (representing nearly 3500 patients) showed that 40% of patients undergoing CTC had additional abnormalities that were detected.2 And, 2.7% of patients had extra-colonic cancers that were detected; an example of such a cancer (and one that is frequently reported as an incidentaloma) — is renal cell carcinoma (RCC). RCC is the most common type of kidney cancer. In 2018, it was estimated that more than 65,000 new cases of kidney cancer would be diagnosed; it was estimated that 14,970 deaths could be attributed to kidney cancer.3 Based on estimations between 2012 and 2014, the lifetime probability of developing kidney/renal pelvis cancer is estimated at 1/48 (2.1%) in men and 1/83 (1.2%) in women.3 The number of new cases of kidney cancer has been increasing, partly because of the increasing life expectancy of patients in the United States, and also because of the aforementioned improvements in abdominal imaging. Therefore, as new cases of RCC are diagnosed in older adults, questions about how to best manage these patients will inevitably arise. Ideally, these elderly patients would be managed with the least invasive option possible, provided that option were still clinically feasible and had the potential to elicit a reasonable outcome. The risk surrounding invasive procedures increases as a patient ages; more aggressive procedures, such as radical nephrectomy, have recently been called into question. However, there are a paucity of clinical data supporting which treatment approach is most common and what strategy may provide the best outcomes. When referring to “small” lesions (< 7 cm) in both elderly and younger patients, there is an emphasis on nephron-sparing procedures such as partial nephrectomy (PN) when the lesion is small and the surgery is deemed technically feasible. 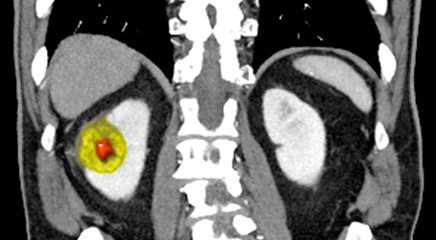 Additional treatments for RCC include radical nephrectomy (RN), percutaneous ablative therapy (PAT), and chemotherapy (including immunotherapy).4 If no treatment is warranted or chosen, active surveillance with repeat imaging is an option. A paper published by Miller and colleagues aimed at further investigating how RCC is being treated in older patients.5 The authors analyzed the National Cancer Database between 2004 and 2015 for patients who were aged 80 years to 89 years (“octogenarians”) and had clinical-stage tumors that were 7 cm or smaller. The octogenarians were compared with a control group of patients whom were aged 70 years or younger. The database capture included 18,903 patients, and they were identified by the primary treatments they received: RN (6761 individuals, 35.8%), PN (2416 individuals, 12.8%), PAT (2924 individuals, 15.5%) and no treatment (NT) (6802 individuals, 36%).